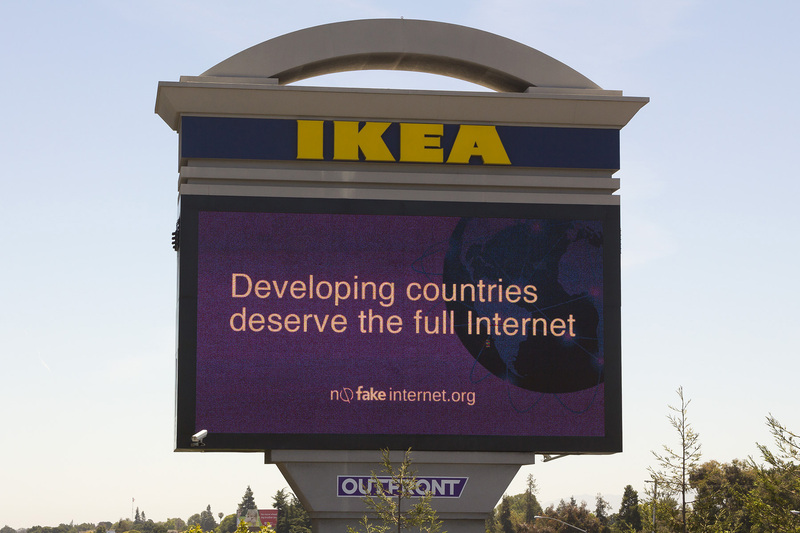 A few weeks ago, we reached out to the OpenMedia community for help to crowdfund a billboard to spread awareness about our NoFakeInternet.org campaign, and pressure Facebook into making its controversial Internet.org service one that promotes access to the full, real, open Internet and respects Net Neutrality. I’m proud to report that we reached our stretch goal! Just the other day, we saw webcam confirmation that our community’s advertisement was up and running on a key highway in the San Francisco Bay area, one that Facebook execs certainly take on the drive to work. Thank you so much to everyone who pitched in to make this happen. Facebook workers and hundreds of thousands more will be seeing this giant glowing billboard for two full weeks— definitely enough time for the message to sink in. It doesn’t treat all data equally, instead favouring its own content over the open Internet. It has already displaced valuable programs for Internet access, like in Panama, where the government cancelled their project to provide free Internet to new users. It sets up one company as a gatekeeper to the net, discourages competing services, and sets up a walled garden for new users. It’s not the real Internet. Users everywhere deserve the full internet, not Facebook’s version. Read our more in-depth blog critique here for more information, and learn more about how Facebook should be using their powers for good. We’ve already heard directly from execs at Facebook, and they’re concerned about our campaign. We plan on keeping up the pressure until they commit to making real changes to their fake Internet scheme. Thanks to generous support from our community, our message is now impossible to ignore in facebook’s backyard. Thanks again to everyone who helped to crowdfund this awesome billboard. If you haven’t already, stand with others around the word today in speaking out against Facebook’s plan to put new users into its fake Internet.